Oil of the Month - F.A.I.T.H. The month of January is the time for New Beginnings. A time to say goodbye to the problems of the past, the projects left undone, the book not written, the goals still unmet. January is a time to cleanse and focus. Clear the cobwebs and sharpen the mind. Get clarity. Hone in on what you want. It doesn’t matter what you did then (last year, last month, last week). It matters what you do now. So create a new list of goals and use Lemon oil to keep you on track. doTERRA’s essential oils are gentle, subtle, and effective. Just a drop or two a day on your palms or the soles of your feet will bring you into focus and inspire that necessary lift to your heart. You’ll feel more aligned and receptive. Banish any lingering depression and move into joy. Live in the present moment with energy and confidence. It’s all possible with Lemon. 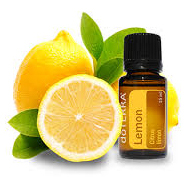 A 15 ml bottle of Lemon oil is approximately $25 (includes tax and shipping). To order, click here and go to Shop for Products → Begin Shopping → Single Oils. Then scroll down the page until you find Lemon Essential Oil. After you start using Lemon, let us know how you’re doing. Post a comment on the blog page or drop us a line via the Contact form. The more we share, the more we help everyone.